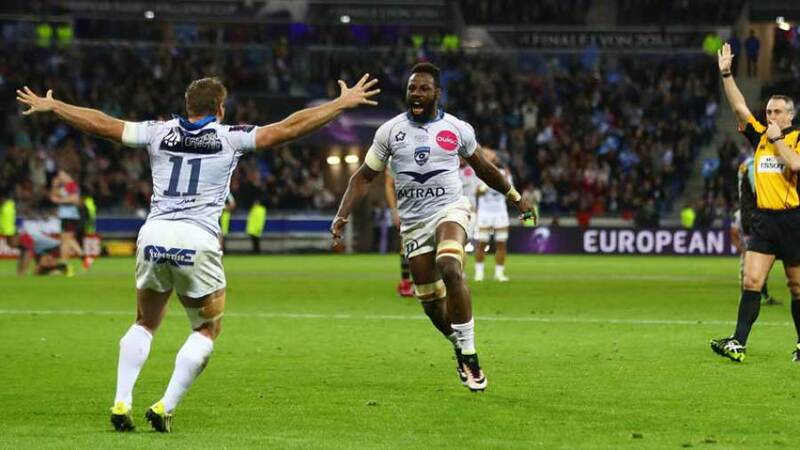 Montpellier put in a performance packed with power to beat Harlequins 26-19 in the European Challenge Cup final at the Grade Stade de Lyon on Friday evening. Substitute Jesse Mogg scored a try in each half, while Montpellier fly-half Demetri Catrakilis kicked four penalties and two conversions to underpin their success. Nick Evans' three penalties meant Quins were in contention at half-time, but Montpellier's heavyweight South African-dominated pack flexed collective muscle at key moments to give French rugby its first Challenge Cup winner since Biarritz four years ago. Wing Marland Yarde scored a late try that Evans' replacement Ben Botica converted - Botica joins Montpellier this summer - while he also added a penalty, but it was too little, too late. Quins' defeat - in Conor O'Shea's last game in charge before he takes over as Italy's new head coach this summer - means they failed to secure European Champions Cup qualification and will again play second-tier Challenge Cup rugby next term. 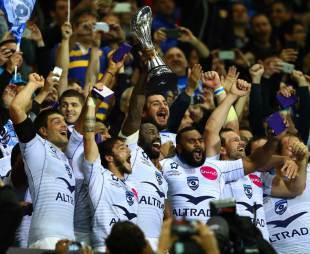 But they could have few complaints after a crowd of 28,500 witnessed Montpellier's revered power game at first hand, as a club coached by South Africa's 2007 World Cup-winning mastermind Jake White won the first major trophy in their history. England prop Joe Marler returned for Quins after completing his second suspension of the season, featuring as one of eight changes following last weekend's landslide home defeat against Exeter as the Aviva Premiership club looked to reclaim a trophy they last won five years ago. Montpellier, meanwhile, were captained by France international flanker Fulgence Ouedraogo, with their strong South African influence underlined by starts for the likes of Frans Steyn, Bismarck du Plessis and Pierre Spies. Both teams put plenty of pace into their game from the start, with Evans kicking Quins ahead through a 35-metre penalty inside four minutes, but Montpellier replied ominously through a Catrakilis strike following strong scrum pressure. Evans then missed a chance to restore Quins' advantage when he saw an angled penalty hit the post, before Montpellier lost full-back Benjamin Fall, who limped off after appearing to suffer a hamstring injury in open play, and he was replaced by Mogg. And it took the Australian barely five minutes to make his presence felt as he rounded off a superb move that saw him take a sublime scoring pass from centre Steyn, with Quins' defence shredded. Catrakilis converted and then kicked a penalty as Montpellier opened up a 13-3 lead, before Evans' second successful penalty came as welcome relief for the English club, given how much pressure they had been under up-front. And it got better when Evans completed his penalty hat-trick just two minutes later following a Montpellier lineout infringement, giving them hope after the French side's forwards had threatened to take charge. Montpellier pressed again before the break, but Quins held them out and trooped off at half-time just four points adrift, trailing 13-9. Quins should have got back to within a point early in the second period, but Evans sent a straightforward penalty chance wide after a Montpellier break-out was halted in full stride by Irish referee John Lacey. And it was to prove a key miss, as Montpellier's forwards once again found irresistible momentum, and the French team posted a second try after pinning Quins just metres from their own line. Substitute scrum-half Benoit Paillaugue then took charge sending a spiralling cross-kick towards Mogg, and his Aussie Rules-style jump above Quins' Wales international centre Jamie Roberts ended with him touching down. Lacey sought confirmation from television match official Jim Yuille, but the try was given and Quins were left with a mountain to climb entering the final 25 minutes. Another Catrakilis penalty took Montpellier 14 points clear, only for Quins to then blow a gilt-edged chance when their Scotland international wing Tim Visser failed to collect a steepling kick with the opposition line at his mercy. A fourth Catrakilis penalty with 13 minutes left sealed the deal for Montpellier, and Quins were left to reflect on a game when the second-half told its own story, despite Yarde's consolation touchdown that Botica converted before the fly-half added a 77th-minute penalty.